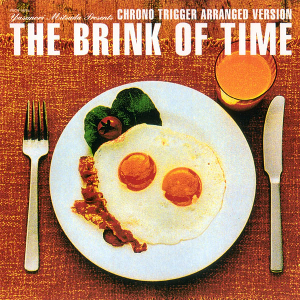 Chrono Trigger -The Brink of Time- may well win the award for most edible front cover with its fried breakfast on the front. However, the task at hand of arranging what many feel is a fantastic soundtrack would be much harder than scoffing down a yummy breakfast. Hiroshi Hata and Kalta Ohtsuki give each track on the arranged album a jazz flavour which immediately unsettles me as I’m not a fan of the genre. However I have sat and let this CD flow over me time and time again before I wrote this review so as not to be biased. “Chrono Trigger” is an intresting jazzed up piece using brass instruments, funky keyboards, and bashing basses to up the ante with a lovely string section in the middle. Overall, the track met my expectations and went beyond them for a jazz arrangement. “Secret of Forest”, however, slows things down for a cool laid back approach and, while there’s no denying the guitar work on the piece is sublime, it just doesn’t do wonders for me. Similarly, “Zeal Palace” just confuses with sparse arrangments and thick bass lines and just never really gets going for me at all. Continuing along, “Warlock Battle” gives us synth electric guitars, computerised basslines, and seemingly live drums for the opening bizarre section. Once the main song gets started things improve greatly and it reminds me a bit of a lost Gitarooman track, which is fine to me! “Chrono Corridor” is another strange blend of synth and live instrumentation, however I enjoyed this track greatly as its jazz fusion and dance elements combine well. “Undersea Palace” gains extra help from Gizaemon de Furuta. There is a beautiful electric / acoustic guitar solo before the keyboard-driven background adds excellent tension to a fantastic track. “World Revolution” continues on the same wavelength with a riot of a track. It comes across like a jazz / arcade freak out — like something from an arcade shoot-em-up. “Brink of Time” gets out the double bass for an intresting track which is not entirely successful in its slinky aim, but is far from offensive. It’s just another track that doesn’t grab me. “Guardia Millenial Fair”, however, does grab me with its olde style musings and slightly offtone and kilter tunings of the instruments. However, towards the end steel drums join in and they just don’t go with the surrounding instruments and it becomes slightly messy. The CD closes with latin jazz fusion “Outskirts of Time” which is a well-acomplished piece that has direction, pace, and skill involved. Despite all this time I’ve owned the CD (several years now), I’m still so very open juried over it. It has skill, class, and a feel that’s relatively original and, yes, it certainly does arrange the originals! Yet I still have yet to really connect with it in a way that means I look forward to coming back to the CD as soon as possible and that annoys me because it’s technically well accomplished. A CD very much down to personal taste — a love or hate arrangment. Posted on August 1, 2012 by Simon Smith. Last modified on January 19, 2016.